Here's a pic of the bee box on our back garden wall under a grapevine. It shows some of the holes have been plugged, hopefully by bees! 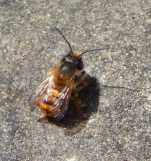 No-one liked our square wooden bee-box (entry hole, glass top and wood lid) sited at the end of the garden, though. They seem to like our lavender (& lavendula), as well as hebe & hollyhocks in my 'wildlife garden', and runner bean and courgette flowers. Pretty much any flowers have their insect fans. We get both bumble bees and honey bees. In the heat of summer (as if), we leave water out, sometimes sugar water. Here's the temporary hive set up by the bee guru to draw the swarm out from under our compost bin lid. 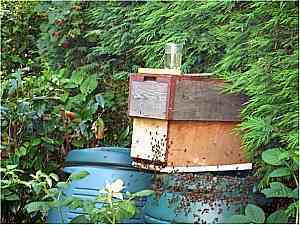 Had a swarm in the garden in a compost bin a while back; local bee society chap came and left a temporary hive nearby, popping the queen in to tempt the swarm. He took them away a few days later; we were really sad to see them go. Site owner's note: Thank you for sharing Jaqueline, and I'll keep my fingers crossed that your bee house provides a wonderful home for bees! 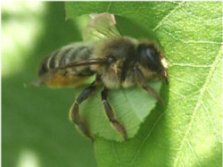 Very interesting to read about the honey bees settling in the compost heap. 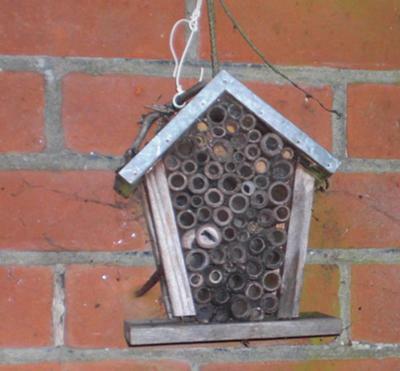 We have only ever had wasps setting up a home in ours, although I am well aware bumblebees sometimes like to make their nests in compost heaps too.